I’m sure those who have had children can understand our sporadic and few and far between blog posts at the moment! This post was created as i needed an easy to make, relatively healthy, energy boosting item of food that i could just grab and eat. Also as i am breastfeeding, i was curious about “lactation cookies” and their supposed benefit in boosting milk supply however wanted something a bit healthier. The ingredients in lactation cookies that help with your milk supply are oats, brewer’s yeast and flax. So i played around a bit and this is what i came up with. I haven’t added flax to these however you could definitely give it a try. 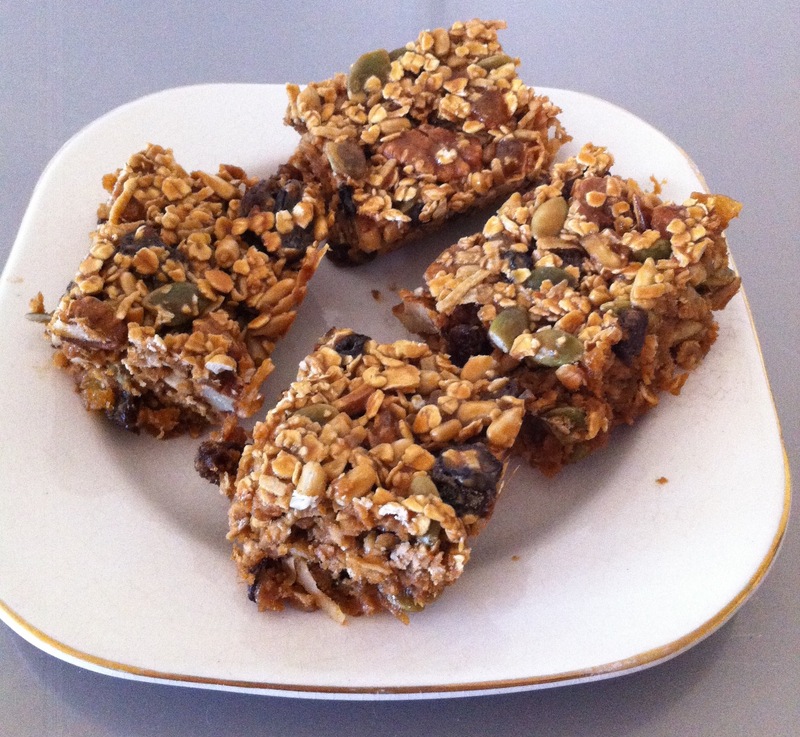 This recipe is based on the ANZAC Inspired Breakfast Bars by Heike at Heike Herrling. I adapted them as to what ingredients i had on hand, added some extra vitamins and minerals and the addition of the brewer’s yeast. If you aren’t breastfeeding, these are still a delicious and relatively healthy snack so you can easily omit the brewer’s yeast. You could also easily make these gluten free by using certified gluten free oats. Preheat oven to 120°C fan forced and line a 29cm x 19cm baking tray with baking paper. Place all your dry ingredients into a large mixing bowl and mix well. In a separate small bowl, place all of your wet ingredients and mix until combined. Add the wet mixture into the dry mixture and with a spoon, mix until it’s well combined and the dry is completely incorporated into the wet. Press the mixture into your prepared tray and bake for 1 hour. Let it cool for 15 minutes in the tray and then slice into your desired size (i got about twenty squares). Then let the squares cool completely before breaking them apart. They aren’t meant to be hard and crunchy, more soft and chewy. Our dream is to live self sufficiently on our own land; rearing our own animals for meat, dairy and eggs, growing all of our own fruit and vegetables and providing a place for people needing regeneration and a new lease on life. With this dream in our hearts and the start of our adventure upon us, we have decided to record it all through videos, pictures and words on this blog. My co2 bottle arrived today for my keg system! !